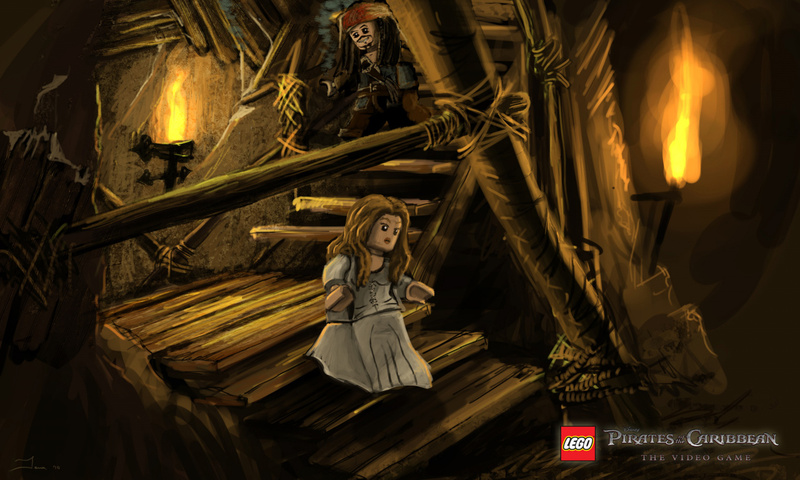 Last year Disney and TT Games joined forces to announce LEGO Pirates of the Caribbean for Wii and DS, and now the twosome have brought us the first trailer for the game and some concept art to boot. 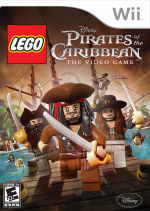 There's no gameplay footage in the trailer but anyone who's played a previous LEGO game will likely know what to expect: single or co-operative play with a range of famous blockified faces, including Captain Jack Sparrow, Will Turner and the other characters most people have forgotten about. Cast your good eye over the trailer and concept art below, landlubbers. Never was a fan of Pirates of the Carribean, but I AM a fan of the Lego games. Though I must admit the formula's gettting a bit old. Awesome! I might actually get this! Haha what a great homage to the opening scene... I love the fact that lego had the pirates be hung here characters still alive! I love the Lego Harry Potter game. So I think I love this one as well. I do have my doubts about this though. Because there is a new movie on it's way. On a related note, I really hope we will see the second Lego Harry Potter game very soon. I note that this says it will be for DS, not 3DS. Missing a trick there, I think. Looks good, might have to buy this one. It's gonna be a pain playing as Jack Sparrow with the way he can't even walk in a straight line. It'll be like playing the Star Wars games as Yoda. But I can't wait! The LEGO games are a favourite in our household. Looks like fun. I'll watch out for it and see if it's something I really want though. I cant wait for this one to come out I need a new Lego game since my son and I just recently beat Lego Harry Potter. I dont know what I am going to do till this one comes out. I guess I will have to buy a box of legos to get my fix in till than. I loved both Star Wars LEGO games, but we haven't been as fond of the others. We played through the first Indiana Jones, but it lacked the magic for me often, and Batman was really hit or miss. We're in the second Indiana Jones, but I'm not really digging the split-screen bit. I prefer better thought out rooms where you can be together (ala Star Wars). So, I'm starting to loose interest in the series. I haven't tried Harry Potter, but doubt it will change my mind. Clone Wars talks about co-op, but on different planets so that you're not actually together like it's a good thing. I think that every Lego game is amazing, but yet I have only played Lego Star Wars. Maybe I'll rent this one and see if like it. I was getting tired of the whole lego game thing too but this looks fun. I'll be all over this one when it comes out! A Lego Pirates life for me harr harr. Now where's my rum? I'm praying this game will be on the Nintendo 3DS! I often say I won't buy the next Lego game, but I have trouble keeping that true. I got Lego Harry Potter and plan on getting the next one, which won'y be for a while. I'm not sure about the clone wars, I'm not a fan of the TV series, but I remember the original Lego Star Wars games that were very good and they added some new features. The Pirates movies were some of my favorites, so I may pick this up. IGN said the combat was more pirate-like in this game. A LEGO Jack Sparrow. What else could one possibly desire in a video game, me hearties. The Lego formula has become stale for me, but I do love Pirates of the Caribbean so I might get this. I wasn't going to even consider getting this. Then I saw LEGO Jack Sparrow. @cyrus_zuo You should try LEGO Harry Potter. It was a lot better than Indiana Jones, who didn't really have any weapons and always was getting beat up. Star Wars was still my favourite of all, but Harry Potter was pretty good too. A least you had spells and it played more like Star Wars where as you had spells to cast like using the Force. I wish the game was going to look the like concept art. Although it is Lego I'd love to see some more stylized less blocky graphics. I have yet to play any of these Lego games but have heard good things for the most part might give this a shot.